When I was growing up there was a field near our first house that, for just a few weeks a year, was full to bursting with fresh, fragrant, luminously green peas growing in their pods. Maybe it was the excitement and subterfuge of sneaking into the field to nick a few pocketfuls that made the reward all the sweeter, but nothing tasted as good as those freshly podded peas - and the memory of popping the pods and snaffling the raw and intensely sweet contents is one of my fondest foodie memories. This dish is an homage to those pilfered pods, with fresh green pea shoots giving the all important raw pea flavour and freshness to a light yet deeply flavoured risotto of pancetta, parmesan, and of course, peas. It’s a simple, comforting dish, with a surprising lightness that some risottos can lack. A dish that eases you into autumn, like one of those rare days of crisp, cold air and late-summer sunshine. Start by frying some cubed pancetta (around 100g is plenty) on a medium heat in a good glug of light olive oil, then remove to a plate once crispy but not crunchy, before adding a very finely diced onion and two cloves of garlic. At this stage I like to add a little salt to help the onions release their juices then cover and leave to cook on a very low heat for about 15 minutes. Adding the lid really helps to sweat rather than fry the onions and makes them disintegrate into a soft, sweet but uncoloured mush. A perfect base for risotto. Once the onions are cooked you need to turn the heat up a little and add your rice, coating it in the onion-garlic-oil mixture and toasting the rice until it just starts to ‘crack’. Be carefully not to overcook your rice at this stage (either cooking too long or too hot) or it will colour and ‘seal’ which is not what you want as it effects the way the rice releases its starch - the thing which gives risotto its creaminess. Next add a large glass of white wine or a glug of saison and deglaze the pan before adding your pancetta back in. Now the fun bit (depending on your persuasion). Add a ladle of hot chicken or veg stock from a pot simmering next to your risotto pan, stir with a wooden spoon and let the stock be absorbed, then add another ladle, stir, let it absorb. Repeat this process of adding stock a ladle at a time and stirring until the rice is just cooked (I prefer it with a little structure but not quite ‘al dente’) and the risotto is looking smooth, creamy and voluminous. This stage could take anywhere from 20-30 minutes - but be patient, pour yourself a beer, stick on the radio, and the results will be worth it. 300g of rice will serve 3-4 people and will soak up around 750ml of stock. If you need a touch more then add a little extra water. Once the rice is cooked to your liking add a large handful of frozen peas, another handful of torn pea shoots, a BIG knob of butter and as much good quality, unpasteurized parmigiano reggiano as you dare (be brave) before whipping the whole lot into a creamy, oozy, delicious wave of a thing that moves freely when ladled (add a touch of water if it’s too stiff). Season to taste with salt and black pepper before ladling into wide pasta bowls and topping with a handful of raw pea shoots, a final grating of parmesan and dusting of cracked black pepper. The freshness of those pea shoots just lifts the whole dish, adding a counterpoint in both flavour and texture to the rich and gloopy risotto beneath - they're essential, and delicious, so make sure you use them when making this. With something like a mushroom risotto - with its deep, rich, umami ladened flavours of autumn - you can afford to be quite bold with your beer choice, even going as far as something like a roasty stout or porter (Titanic Stout springs to mind), but this risotto is a different thing altogether. 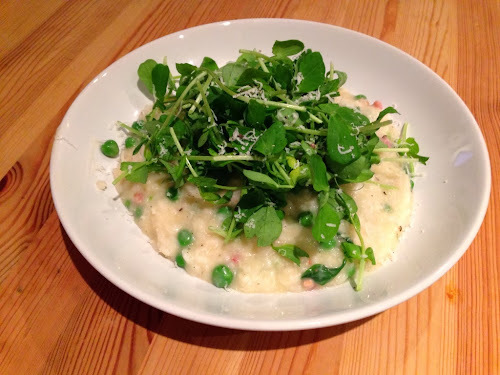 The lightness and freshness of those pea shoots really push you towards the lighter end of the spectrum, yet the risotto itself is rich and spiked with pig - so what do you go for? Well, as is often the case, Saison would be my recommendation. It is such a versatile style with food and the herbal, peppery hops underpinned by funky, savoury base notes from the yeast, would be excellent with this dish. As it turned out, I had a bottle of chilled Saison Dupont in the fridge, which fitted the bill rather nicely. A beautiful match that still allowed those pea shoots to hold centre stage, yet dovetailed extremely well with the dish. The heading makes it sound rather less appetising than the recipe does. Haha this has been pointed out to me.... Not even sure how I managed that one as it is spelled correctly everywhere else. Anyhoo, hilarious mistakes are the best kind.